On Friday the NSW Supreme Court ruled in favour of the Australian Vaccination Network’s appeal against the HCCC’s public health warning. Based on Justice Christine Adamson’s interpretation of the HCC Act, the HCCC did not act within jurisdiction. This means the HCCC warning is no longer valid. The outcome also means that the HCCC recommendation for the AVN to post warnings as to it’s antivaccination, non-medical and non-governmental stance are void. Complaints upheld by the HCCC can no longer stand. Whilst congratulations rightly apply to the AVN their “victory” has come at the price of conceding any real community impact and the denial of certiorari (crucial to Dorey’s promised OLGR appeal). Confirmation of being a Health Care Provider may bring complications for the usually free falling AVN. Initially Dorey’s argument was that the HCCC investigation was “illegal”. That they did not fall under HCCC jurisdiction because the AVN is not a health care provider. Dorey conceded in the Supreme Court on July 28th 2011 that the AVN did fall under the HCCC jurisdiction as a health care provider. Because the HCCC jurisdiction to investigate requires a complaint, the court ruling then focused on interpreting the HCC Act under section 7(1) – What can a complaint be made about? The HCCC had upheld two complaints against the AVN. The judge deemed that section 80 of the Act provided specific functions of the HCCC that ruled out dealing with complaints “per se”. In my view, the use of the words “the clinical management or care of an individual client” evince an intention that only a complaint concerning a health service that has a concrete (even if indirect) effect on a particular person or persons is within jurisdiction. Complaints about health services that have a tendency to affect a person or group, but which cannot be shown to have had an effect, would appear to be excluded. The HCCC submitted that I ought infer that the information the plaintiff has published on its website about vaccination has affected the decisions of people to vaccinate themselves or their children. In my view, the use of the words “the clinical management or care of an individual client” evince an intention that only a complaint concerning a health service that has a concrete (even if indirect) effect on a particular person or persons is within jurisdiction. Should the HCCC have ensured this aspect was covered? Arguably yes. The very problem it would face in court had been laid out before them by the AVN well in advance. The Act dictates how the HCCC function and this entire matter had grown from complaints – the subject of section 7. So yes, the HCCC should have been prepared. Could “direct affect” upon clients have been established? However, the ease with which it might have done so is not the test. It did not do so. As I have found, the evidence adduced before me is not sufficient to bring the complaints within s 7(1)(b) of the Act. Yes. It appears that direct affect upon clinical management or care could have been established by the HCCC. I wonder if Adamson’s original draft has “head desk”, scribbled in the margin? Let’s not forget who we’re talking about here. 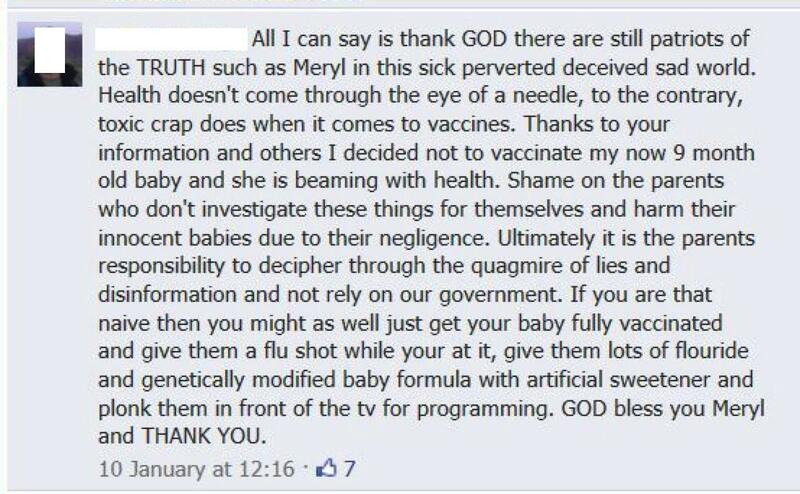 Dorey isn’t just anti-vaccine but pro-disease. You may remember the vicious attack in Police called in by anti-choice zealot because mum exposed child to chicken pox! But no – a mother who exposes her child to chicken pox – a disease that has never been considered deadly… an action that all our mothers and grandmothers would have taken – is threatened with police action or child protection because a man who considers vaccination to be a sacrament of medicine, reported her to the authorities and they didn’t laugh him down. Keep in mind that giving someone a live virus vaccine (chicken pox, measles, mumps, rubella) is already deliberately infecting them with the virus. Now that the AVN is a Health Service Provider under the HCCC’s jurisdiction one wonders just how much more feral ranting can go unnoticed. There can be no doubt what influence on care is intended by that article. 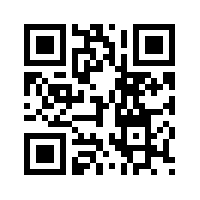 To this we can add the sum of the rubbish Dorey sells online as alternative health choices and natural cures. The very purpose of such material is to influence clinical care. It is reasonable to suggest the HCCC missed an opportunity which cost it a case. Yet exactly how much of a “victory” it has been for the AVN has not yet been decided. Today Meryl Dorey returned to the Supreme court NSW to resume her fight to overturn the NSW HCCC decision that the AVN should place warning notices that it provided anti-vaccination information on it’s website. Dorey has claimed that the HCCC investigation was “illegal” as the AVN was outside HCCC jurisdiction being not a health care provider or health educator under the HCCC Act. Dorey also claims the investigation was flawed because it was not independent, but by a government organisation that “set out to support government policy which is pro-vaccination”. Whilst still publically maintaining lack of jurisdiction to members today, referring her members to this denialist conspiracy rant, I understand that Dorey and the AVN are certainly within HCCC jurisdiction. The AVN conceded so in court on July 28th. Unseen developments aside this is likely to remain. … the AVN provides information that is inaccurate and misleading. 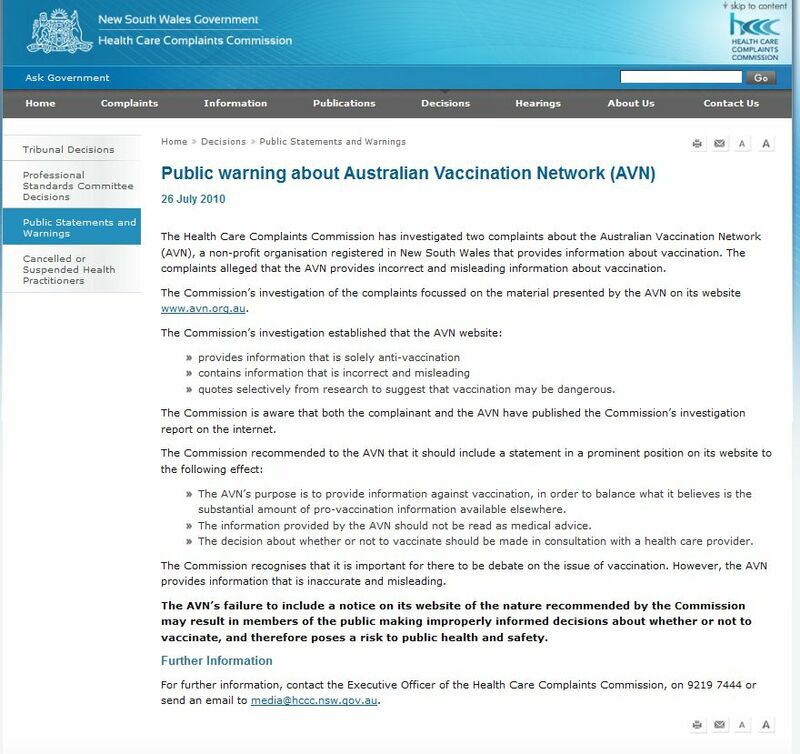 The AVN’s failure to include a notice on its website of the nature recommended by the Commission may result in members of the public making improperly informed decisions about whether or not to vaccinate, and therefore poses a risk to public health and safety. So to spell out the obvious, most of what Meryl Dorey is railing against is by her own hand. All this effort to pretend she’s not anti-vaccination need never have been wasted. The hysteria over her being a risk to public health, quoting selectively from research, giving incorrect and misleading information leading to improperly informed decisions was all her own doing. I cannot stress that enough. The difference between what the HCCC requested and what Dorey created is huge. Also her claim of not being under HCCC jurisdiction and not giving medical advice somewhat deconstructs itself by her refusal. By refusing to inform readers information shouldn’t be read as medical advice, we may infer that she believes it should. By refusing to support consultation with a health care provider she is in effect denying sound medical advice. Later ramblings about suppression of her right to free speech are as good as incomprehensible. As you all would be aware, the Health Care Complaints Commission (HCCC) illegally ‘investigated’ the AVN, and asked us to put a statement on our website to say, amongst other things, that we were anti-vaccine. We refused to do so and, as a result, they released a statement that we were providing deceptive and misleading information and were a danger to the public. The implications of this action are much further-reaching than the AVN as I will explain a bit further on. Right now, we are blocked at every turn because of this HCCC finding – and that was the whole idea behind this. Even the [OLGR] which openly admits that they found no evidence of fraud in the breaches they discovered in our operations – breaches of a purely administrational nature – have said that the HCCC findings will influence their final decision which is due out shortly. And the HCCC had no jurisdiction to investigate us. Three lawyers, two barristers and a QC have all said this is the case. The HCCC acted outside their jurisdiction and outside the law. It is certainly not the first time the HCCC has acted in an incorrect manner and this body, set up to protect the people of NSW from incompetent and dangerous doctors, seems to have a long history of being partial to the medical profession whilst coming down hammers and tongs against those in the natural health arena. Speaking of the OLGR after this is over comes the appeal against the OLGR investigation and ministerial decision. Dorey also dismisses the OLGR investigation and October 20th, 2010 revocation of their charitable fundraising status (authority to fundraise) by the Minister for Liquor, Gaming and Racing as “based on the HCCC decision”. 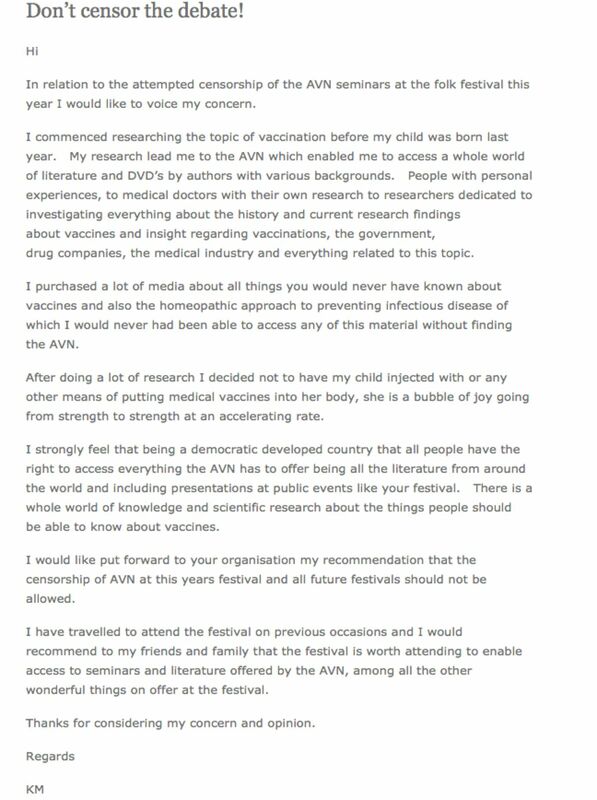 [Letter here] More than anything, her conduct after this changed the view of Dorey as just an anti-vacccination crank and exposed the money making angle. Whilst not in the Sensaslim league, tactics are similar. Lie, feign outrage, produce confident media releases “clarifying” the egregious and erroneous mistakes of authorities, boast of confidence in being found not guilty and above all control the flow of information. Also simply inventing falsehoods and failing to deliver on legally obtained income such as magazine subscriptions. Dorey also reported the OLGR audit findings as typical of any small, volunteer run organisation – size of donation tins, receipt giving and keeping of copies, etc – and had reported confidence that no fraud would be found. 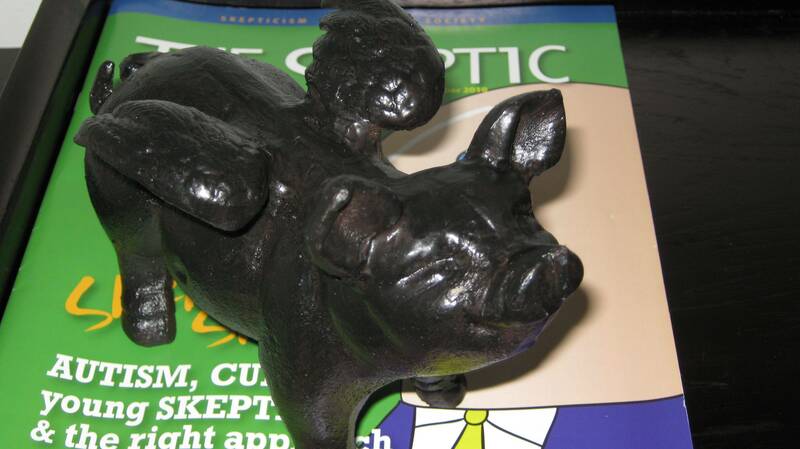 They also reported not having an auditor during the time they were found to be fundraising without a licence. During a rather delightful discovery it turned out the AVN had admitted having auditors over the time they told the OLGR that they did not. This was inadvertently admitted as part of a scam to raise money over a non existent advertisement. In fact the OLGR found 17 breaches of the fundraising act including offences that carry fines and deliberate misleading of the public. Sadly penalties for charity fraud are quite lenient, which renders the creatures responsible as cowardly as they are reprehensible. So, what of this line Dorey feeds over and again to her members and the media? The OLGR are flawed because they relied on the HCCC. Because of the deceptive nature of AVN website presentation – which led to the HCCC request – the OLGR also concluded individuals may donate in good faith and “noted the HCCC decision”. That’s where it ends. The OLGR in no way “based” it’s decision on the HCCC, but arguably had the AVN complied initially the OLGR may have ruled somewhat differently. Perhaps a suspension of authority, I really don’t know. Either way, Dorey can only blame herself and her arrogance for the HCCC public notice. As for the OLGR decision, in light of the evidence, this thief, liar and scam artist who has also lived on the takings from her loyal if clearly misguided members has really already won so much. The fact she believes she can legitimately trade as a charity again and has been wronged tells us far more about the psychology of Meryl Dorey than about the dynamics of her crimes. The amount raised for the Bounty Bag scam and promises of independent vaccine testing is reportedly around $308,000 over 3 years and 8 months [page 13]. On top of that are numerous other scams based on the same technique one of which called for members to consider donating their Maternity Immunisation Allowance. This kicked off almost two months to the day after her first media release on the topic mentioned in item 1 above. Dorey claimed others were doing so, because without AVN lobbying to “ensure legislation” for the MIA and Childcare Allowance, they wouldn’t have it anyway. This is entirely bogus. Presently Dorey is calling for help to read the policy documents on the Healthy Kids Check. Yet somehow just can’t quite report the facts to her members.